Have you ever wanted to learn how to make your own top water wooden fishing lures and did not know where to start? Have you ever wanted to learn how to build lures using thru-wire construction, saltwater metal lipped swimmers ?? I will show you how to do it!. Hi, my name is Kermett Adams and thanks for stopping by. If you have an interest in learning how to make your own wooden top water fishing lures; I can show you how to do it. 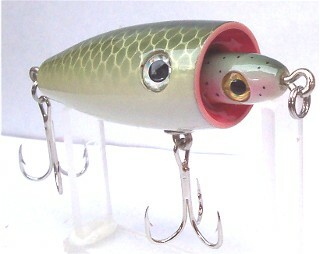 You can learn to make beautiful, high quality lures. Pics of Fun Times on the Lake!!! My second most enjoyable thing is to make the wooden top water lures that I catch the bass with and to show other people how to do it. For the price of a two or three quality fishing lures you will learn many tips and skills required to make your own wooden top water fishing lures. This instructional ebook goes into much more detail than other books I have seen on making wooden lures. 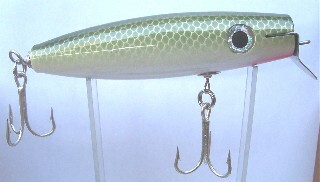 100% of the focus of this lure making ebook is on how to make and paint wooden top water fishing lures. Even if your interest lies in making wooden lures other than top water; you will benefit from my woodworking and wooden lure painting tips. I will lead you step by step on everything you need to know to make beautiful wooden fishing lures that you will be proud of. I also am an avid top water bass fisherman and I can tell you that it is very exciting and rewarding to catch fish on your own handmade fishing lures. This ebook is loaded with many color pictures illustrating all the key steps of making wooden fishing lures. 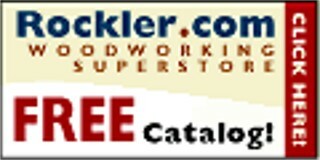 You will get detail here unlike any other book or CD that I have seen on making wooden lures. There are 30 Chapters loaded with tips on all the aspects of lure making that will save you time and money. I cover every aspect of lure making from sourcing all the materials down to lure packaging once you have your lures made. Here is the source for many of my lure components. Another way you will benefit from my experiences has to do with the tools and materials you will need. As I was starting out I spent countless hours and dollars on tools and raw materials that I eventually scrapped. I have tried many kinds of hand tools, wood, and coating products to come up with what has worked best for me . With the basic set of woodworking tools that I describe you can either make just a few lures for your own use or you can make hundreds to start your lure business. In this ebook I list and describe the exact use of the tools that I have found to be best for wooden lure making. I will show you where you can find some of the hard-to-find tools that are essential for making wooden lures. You will save many times the cost of the ebook by not purchasing useless equipment like I did. Take advantage of my experiences and methods that I have found by trial and error in many cases. You may think that finding wood to make lures from would not be a problem. My guess is that there is at least a 95% probability that you will not find the best wood for lure making available in your home town. I will give you the sources for great wood for lure making. There are many, many kinds of paints, varnishes, lacquers, varathanes,shellacs,and other coating materials available to paint your lures with. I know because I think I have tried most of them. Many of them work fine except for one of two key reasons. I will show you the best materials that will result in beautiful as well as durable lures. You will learn what works best for the base coat and what works best for the color coat. Getting a clear coat on your lures that is both good looking and durable is one of the most difficult parts of lure making. I will tell you of some of the best products for that "killer" looking lure. 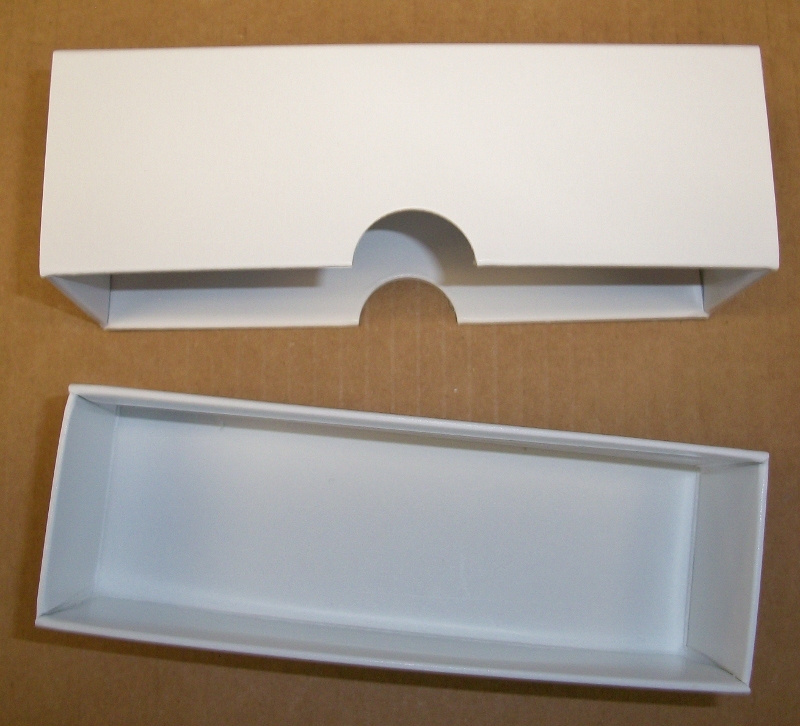 Getting the right coating products is just about one-third of the painting process. In this ebook you will learn all the things that I have learned regarding the paint application equipment/tools as well as the processes of getting the paint on the lures that I have learned through trial and error. 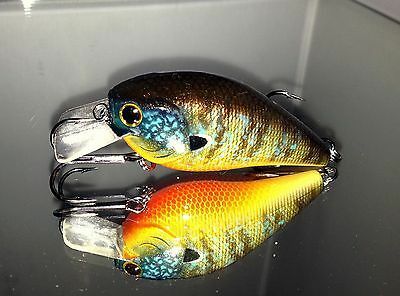 I will show you the best paint application processes for all the steps in the painting of lures. I have wasted a lot of paints just selecting the best thinners for them. You will get all that info here.Some of these paint materials you will not be able to find in your home town. I will show you where to find them. 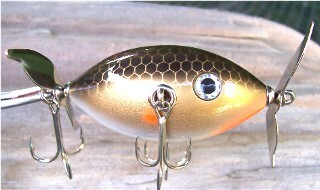 Quality paint jobs on your lures can be a daunting task. I can make it a lot easier for you and save you much wasted time and money. What you will learn in the lure painting sections alone is worth many times the cost of the ebook. Have you wondered how to get scale patterns on your lures without being an expert artist? You will learn the steps in this ebook. I will show you the materials you need and how to use them. Have you wondered how lure makers get the eyes on the exact same place on the opposite side of the lure? I will show you all the details in the steps to achieve this. I will show you how to set it for one lure then you can repeat the same steps on hundreds of lures and have the eyes in the same place on each lure. You will learn of the different kinds of lure eyes are available and the one that I prefer to use. 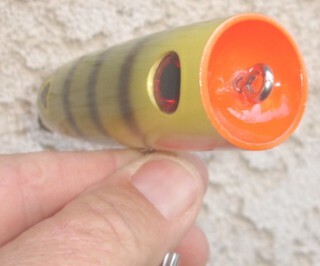 There is a second method of eye placement and drilling that allows for easy placement of the lure eyes above or below the center line of the body. I will show you where to get the best masking tape and how to use it. 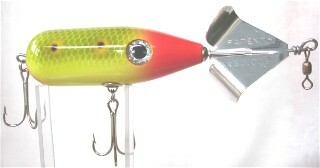 Painting with masking sheets permits you to paint patterns on your lures that are otherwise very difficult. 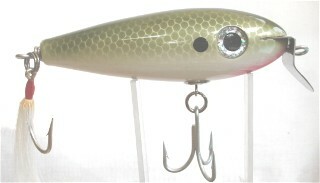 The use of masking sheets will aid you in painting lure patterns like the one below. Top qaulity lure stencils. For $19.95; or the price of two or three lures you will learn to make $100s worth of new wooden lures for you own use, for gifts to fishing friends, or to sell. This ebook is a digital product and is in .pdf file format. It is available for download to your computer immediately after you make the purchase. The ebook can be purchased on a secure connection either with a credit card or PayPal. You can either save the file on your computer for reading there or you can save it and print a hard copy for your future reference. The document was created in MS Word and can be downloaded and viewed with any similar word processing software. You also get FREE Bass Fishing Basics and 78 Fishing Discoveries Unleashed ebooks with your purchase of my lure making ebook. Increase your fishing knowledge while you learn to make your own wooden lures. There are No shipping costs, No delays and it is available for Instant Download! You can be reading and learning how to make your own lures within minutes from now. When you purchase my ebook you are not buying from a webmaster with no knowledge about lure making or bass fishing. I am either fishing or making lures almost every day. You can contact me any time after the purchase with questions and I will assist you any way I can with your lure making endeavors. If you have ever tried to make concave popper mouths in wooden lures, you know it can be a difficult task.You will be AMAZED how quick and easy the process is I will show you in this ebook. If you enjoy lure making or if you are just getting started; don't miss this opportunity to simplify the process of making mouths in your popper lures. This alone is worth the $19.95. If you are serious about learning how to make wooden lures, I am so confident that you will benefit from my ebook on lure making that I am offering a 100% Satisfaction Guarantee! If you feel you have not benefited from my ebook; contact me for a refund. This offer is good for 8 weeks from the day of purchase. 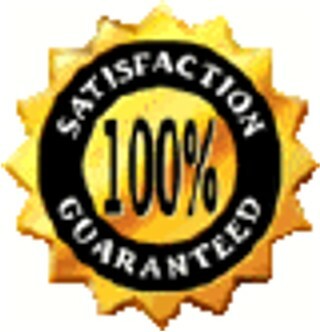 Make your purchase with the confidence that you will benefit from my lure making experiences; OR get your money back! Get started on a wonderful hobby. I will show you how. I am an avid bass fisherman, lure maker, and I am the author of this ebook on making wooden lures. If you get stumped with your lure making, days, weeks, or months from now; drop me an email and I will help any way I can. Hunters! Learn How to Buy Your Guns Wholesale! You will learn of wood sealers and how to use them to make more durable wooden lures. One of the most difficult processes I found in lure making is getting perfect concave mouths in popper/chugger type lures. I will show you how to do it in great detail. You will learn of the tools you need as well as how to use them to create perfect lure mouths that are the same from one lure to the next. I have never seen this described anywhere else in another wooden lure making book. Next to the information on the painting processes that you will learn;this part may be the second most valuable thing you will learn in my ebook. You have to see it to believe how easy it is!!! 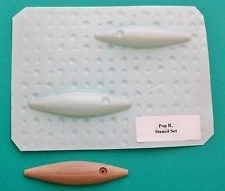 I will show you the tools and how to use them to make perfect popper mouths up to 1 inch in diameter like the one above. 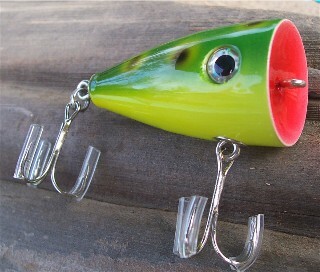 They are quick and easy to make and will be the same lure after lure. With the assistance of many color pictures and detail, I will lead you step by step through the processes of making these lures with beautiful and functional popper mouths. You will be able to apply my techniques to making any style of size of popper lure that you like. The size, style, and shape lure you make will be limited only by your imagination. 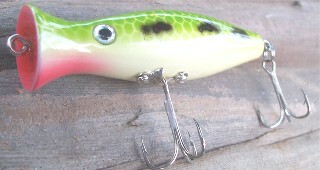 With the lure making skills I will show you; you will be able to make that "magic" bass catching lure. By this time you will have the basic knowledge and skills of wooden lure making to make almost any type or size of chugger/popper, stick bait, prop lure, or dogwalking type that you can imagine. You will be able to make some of the old lures your grandfather used and you can't find them to buy any more. You will probably even come up with a new one or two of your own design. 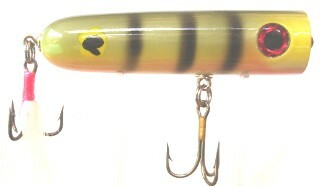 In my ebook I will show you in great detail how to make a couple of my favorite wooden top water lures. Lures like the three above are fun to make, give to friends, or sell if you choose. 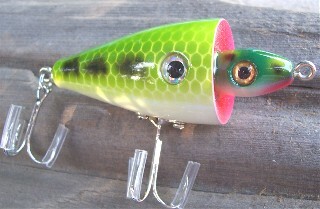 They are not only a lot of fun to make; THEY CATCH BASS just like other popper/chugger type top water lures. You won't find top water wooden lures like this in your tackle shops; but I will show you how to make your own. With the step by step processes I will show you in my ebook you can make lures like the three above or use the processes to make your own style and shape predator/prey lure. If you enjoy the heart stopping topwater explosions of a big bass hitting a buzz bait and would like that lure to be a floating lure; this lure is for you. In my ebook I will show you how to make your own. 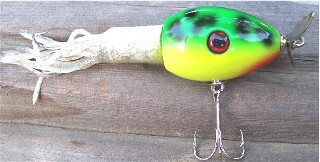 This is another style lure that you will not see in tackle shops. I will show you how to make these wood body buzz baits. I will show you the step by step detail of how to make the 6 inch monster buzz bait on the above left as well as the 3.25 inch buzz bait in the middle and the floating wooden buzz bait on the right made with thru wire construction. 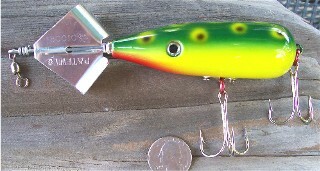 The wooden lure body on it is 4 inches long; total lure is 6 inches long. You can then use my processes to make any style or shape wooden floating buzz bait. A floating buzz bait affords the fisherman the option of slowing the lure or even stopping it as compared to the metal ones that sink if you stop the retrieve.Purchase my ebook and starting making your own floating wooden buzz baits and get in on some exciting fishing action. With the processes I will show you in this ebook you will have the basic skills to make almost any lure you like. You will be limited only by your imagination. You will be able to make beautiful replicas of your old favorites or you will be able to come up with lures of your own design. Making your own wooden lures is almost as much fun as all the big fish you will catch with your own lures. Below are just a very few of the kinds and styles of lures that I make and before long you will be making even better looking ones!! GET STARTED ON A FUN HOBBY NOW! 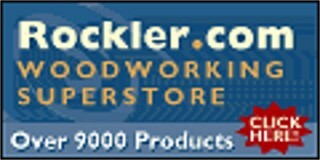 WoodCraft has the best prices on hard to find forstner bits for lure making. Learn How to Make Your Own Wooden Top Water Lures for Large and Smallmouth Bass, Stripers, Musky, and Many Other Species; Both Saltwater and Freshwater. Are you a trophy musky fisherman? Do you go after big stripers and other large fish and would like to build your own heavy duty wooden lures with thru- wire construction? I will show you how to do it. Would you like to build your own 5 to 8 inch long heavy duty poppers, needlefish, or walking type lures with thru-wire construction? It is not as difficult as you think. At $15 to $25 a pop when you are buying these lures, making your own can really be rewarding. I will show you step-by-step how to do it and where to get all the lure components you need. Are you a saltwater striper fishermen and would like to make your own lures? I will show you where to source all the lure components you will need. I will show you step-by-step how to cut the metal lip slots with detailed pictures to lead you through the process. I will show you the easy steps of mastering the tail wrap of the wire. 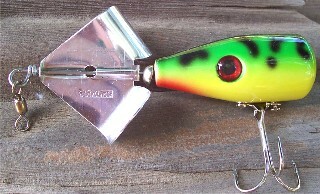 Thru-wire construction of this lure is easy when you know the tools to use and how to use them. I will show you how to build an easy to make lure body holder to ensure you get the same lip slot cut in lure after lure. With the basics in metal lipped lure building that I will show you; you will be able to build any style, size, and shape of metal lip swimmer you like. You will be able to make round nose lures and any variation of the flat nose lures like the two examples below that I make. You will learn how to tune these lures once you have them built. 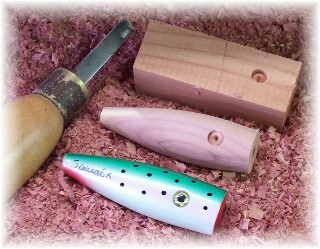 The key elements of wooden lure making to get you started on a fun hobby. You will learn of the best woods for lure making and where to get it. Sources of all lure components you will need are listed in the ebook as well as insight on the best components for certain types of lures. The basic tools needed for making wooden top water lures are all listed here plus info on how to use them. Painting your lures can be a daunting task. 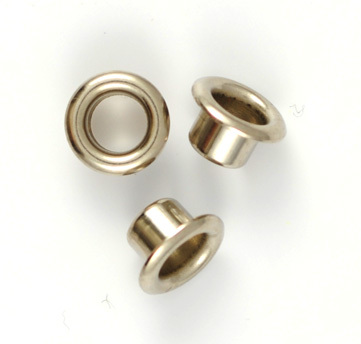 You will learn the best coating materials and how to apply them. The best paint for a base coat and how to apply it. You will learn of the best paints for the color coats, where to get them and how to use them to make beautiful wooden lures. The job is not done until a good clear coat is applied. You will learn of some great clear coats and how to apply them. 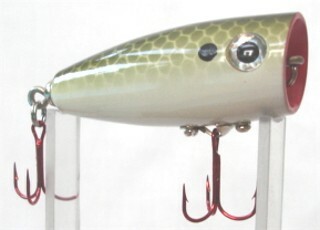 You will learn how to use an airbrush to paint wooden lures plus money saving tips on air compressors. What types of lure eyes work well, how to position them on the lures, and where do I get the eyes. All of this and more on lure eyes are in the ebook. You will learn how to make a jig for drilling eye holes in exactly the same place on lure after lure. How to use masking sheets for painting unique patterns on your wooden lures and which masking tape/sheet is the best to use. 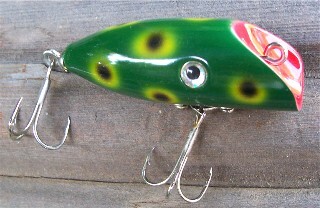 You will learn how simple it is to paint scale patterns on wooden lures and where to get the needed materials. For certain types of lures the use of a good wood sealer is critical. You will learn of sealers that are easy to use and very effective. If you have ever attempted to make a popper mouth with hand carving methods or even a Dremel tool; you will marvel at how easy it is to make perfectly shaped and uniform popper mouths of all sizes. You will learn of the tools needed and exactly how to use them. With what you will learn here you will be able to make your own saltwater striper lures. You will learn how to make flat nosed or round nose Danny style swimmer lures. You will learn how to cut consistent lip slots from one lure to the next. A difficult task of making thru- wire construction lures is the tail wrap of the wire. You will learn of the tool you need and how to use it to get perfect tail wraps even when using the large .062 SS wire. Lure components for thru-wire constructed lures can be hard find. You will learn the best sources. Many of the processes on lure making in this ebook are illustrated with color pictures. 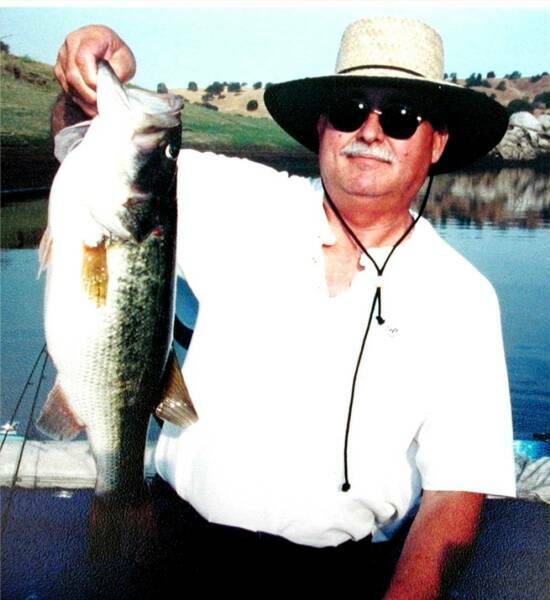 The author of the ebook on how to make wooden lures is an avid fisherman and lure maker. Additional assistance with your lure making efforts is just an email away. This ebook is available for instant download. Within minutes from now you can be started on a great new hobby that can be almost as much fun as catching big bass!! Guide to Making Metal Spoons, Spinners, Jigs,Sinkers, Etc. 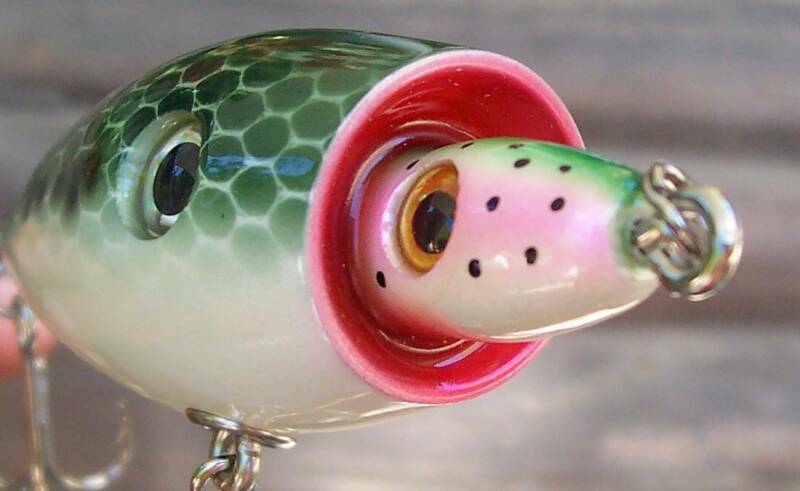 Lure Making Tip:Here is the best way to make a perfect popper mouth. Click to see how to drill center hole. A great source for all your lure parts needs. Check this out to learn how to make your own bass catching rigs and lures from stuff that you probably already have in your tackle box. LurePartsOnline- Home of more than 10,000 lure components! Making Crankbaits Made Easy Here.